FORT WORTH, Tex. (Sunday, Sept. 15, 2002) - In a storybook season finale for the ages, and a race that would go down as one of the best in motorsports history, Sam Hornish Jr. edged title rival Helio Castroneves to win the Chevy 500 and his second consecutive IndyCar Series championship at Texas Motor Speedway. Hornish beat Castroneves to the line by .0096 of a second - the second-closest finish in history - to earn his record fifth victory of the season in the No. 4 Pennzoil Panther Chevorlet and become the first driver to win two IndyCar Series titles. 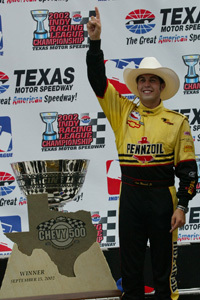 Hornish ended up winning the title by 20 points over series and race runner-up Castroneves, 531-511. "It has been an incredible season," Hornish said. "It would have been a little bit better if the driver hadn't have screwed up at a couple of races. The Pennzoil Panther crew, they do an awesome job for me. "This year I needed to win. It's a great feeling." Hornish averaged 163.981 mph in another wild Texas race that featured 21 lead changes. He earned $125,400 for the victory and a $1-million bonus for winning the title. "Sam is just the greatest driver I have ever seen," said Pennzoil Panther co-owner John Barnes, a veteran of more than 30 years in Indy-style racing. "We're just so blessed, lucky to have him, to have him a part of our team, and you know he understands these blessings, also." Pole winner Vitor Meira finished third in the No. 2 Chevy, with Scott Sharp fourth in the No. 8 Delphi car. Alex Barron rounded out the top five in the No. 44 machine. Just .3628 of a second separated the top five in another fantastic Texas finish. The two closest finishes in the seven-year history of the series have occurred in the last two races, with five of the 15 races this season decided by less than one-tenth of a second and eight races with finishing margins of less than one second. Hornish and Castroneves hooked up in a stirring side-by-side duel with 24 laps remaining. With 10 laps to go, Castroneves was ahead by inches over Hornish and already had clinched the two bonus points for leading the most laps. The title contenders remained side by side for the last eight laps, weaving around lap traffic, refusing to yield position. Hornish could have clinched the title even by finishing second to Castroneves, as both drivers would have finished with 521 points, but Hornish would have earned the tiebreaker for more victories this season. But Hornish refused to take the safe route to the $1-million bonus and IndyCar Series history. Plus Meira, Sharp and Barron stalked him relentlessly, with one slip by Hornish costing him the title. So Hornish continued to race alongside Castroneves - Hornish high, Castroneves low - through the stretch run, wheels inches apart. At the end of Lap 199, Hornish led by .136 of a second. The duo charged in lockstep around the 1.5-mile oval - Meira, Sharp and Barron threatening from behind - for the entire final lap, with Hornish holding off two-time Indianapolis 500 winner Castroneves by inches at the finish. "I tell you, that was incredible," Castroneves said. "It couldn't be more exciting. What a great finish. We started racing with each other all the way through until the last lap. Like I said, it was going to be the last lap on this last racetrack. What a fantastic finish. "What a fantastic series. I couldn't be happier. Obviously, I want to win the championship, but unfortunately, that's not the way it would go. But it's great to challenge guys like that (Hornish). He did a hell of a job. His team did a hell of a job, but I have to thank my team. What an awesome team. It's a shame: Guys, I tried really hard, I think you guys saw. But, hey, there's always next year." It appeared for a while midway through the race that Castroneves, who entered the race 12 points behind Hornish, might not need to wait until next year. Hornish made his second pit stop under green-flag conditions on Lap 86. Just three laps later, veteran Jeff Ward and rookie Hideki Noda crashed, bringing out a caution flag. Castroneves took advantage of the caution period to make his second stop in the No. 3 Marlboro Team Penske car and re-entered the track in the lead. Hornish was eighth. But Hornish confidently worked his way through traffic and climbed to third by Lap 130. Hornish passed Castroneves for the lead on Lap 146, and they began a spine-tingling duel for the next five laps, trading the lead three times between each other in a preview of the stretch-run showdown. Hornish started the final cycle of pit stops among the lead group on Lap 153 with a 10.8-second stop, with Castroneves in the pits for 9.8 seconds on his final stop on Lap 158. Castroneves took the lead on Lap 165 when leader Meira made his first pit stop, with Hornish in fourth. Hornish climbed to second by Lap 175, and he and Castroneves began their side-by-side showcase of driving skill and courage two laps later. The margin between the two drivers at the start-finish line exceeded one-tenth of a second only twice in the final 24 laps. "It was a great season, and the competition was unbelievable," said Roger Penske, Marlboro Team Penske owner. "Today's finish was another testament to the close racing in the IRL, and we're proud to be a part of this series. "I want to congratulate Sam and the Panther team - they're a real class act."